If you've tuned in to KONR 106.1 FM in Anchorage in recent months, you might have heard a live show from a local musician, someone talking about the card game Magic: The Gathering, or a show that focuses on Alaska music. That is, if you're in a part of town where you've been able to get the signal on your radio. Low-power FM station Out North Radio is getting back on its feet after some time stagnating. With a new location, live shows and a grassroots focus on community voices in Anchorage, the station wants to push back against corporate radio and bring new life to its pocket of downtown. "In Anchorage, the anecdote everyone tells each other is this is the most diverse community in the U.S., and it feels like that when you drive around all the neighborhoods," said Jason Sear, the station manager. But across all kinds of media in town, he said, those diverse perspectives aren't represented. "We're trying to bring in all these community voices that are unheard." Last year, the station moved to a small space in the Sunshine Plaza, tucked next to the Rusty Harpoon gift shop and a store that sells pricey furs. 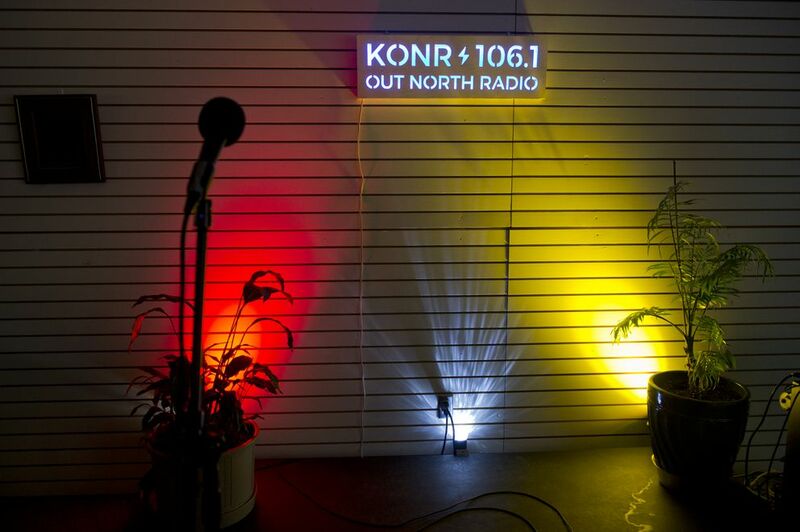 KONR is part of the contemporary art house nonprofit Out North, which owns the radio station's license. The organization as a whole was started in 1985, focusing on LGBT arts. For years, the group was based in East Anchorage in the old Grandview Gardens Library. In 2013, the Out North board of directors realized the nonprofit didn't have enough money to continue, said board president Indra Arriaga, so it closed down. 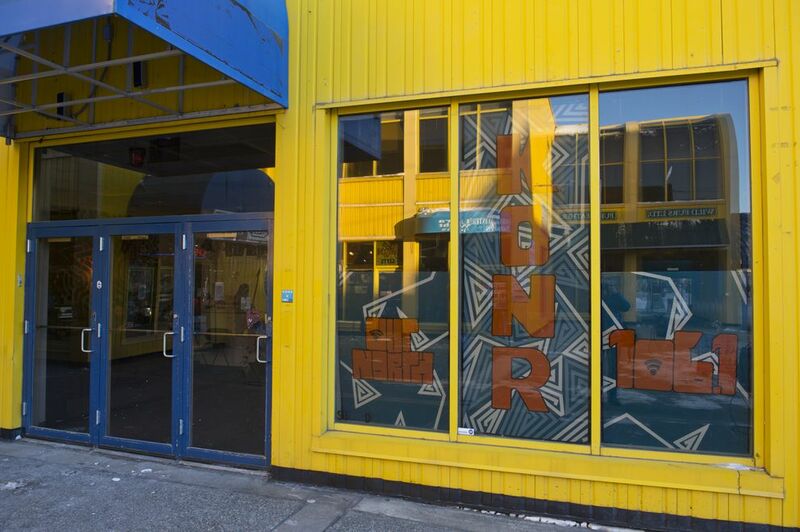 Last year, Out North made a big push to build things up again, collaborating with the Anchorage Downtown Partnership to move not just the radio station but also a gallery into a location on Fourth Avenue. Instead of directly paying rent for the space, the group is tasked with fundraising and drawing people to shows and events in a part of downtown they might not otherwise frequent. On the other side of the street nearby are the Hard Rock Cafe, the Avenue Bar and the Panhandle Bar, but there isn't much to attract pedestrians on the block just east of there. "ADP is trying to bring some life and bring some arts to downtown in general, but also the part of downtown that doesn't have much life at the moment," Sear said. When tourists are around, he notices them meander toward where KONR is. Through the station's floor-to-ceiling windows, he often sees them turn back. The hope is that the space will convince them to linger. "That block that people tend to be skeptical about is starting to change," said Arriaga. The station's small, distinctly DIY space is scattered with plants, but mostly open and empty except for the desk with broadcasting equipment, pianos, a stage and a lounge area. One wall is covered with a mural. A poster with a drawing of Beyoncé from her "Formation" music video reads, "STOP INTERRUPTING my grinding." In a small room in the back, an ACLU sign that reads "DISSENT IS PATRIOTIC" is propped up behind a keyboard. 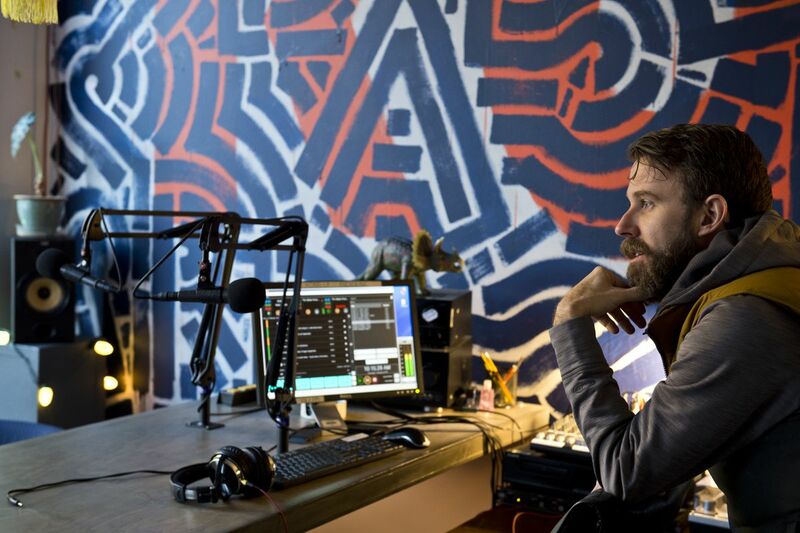 "We want to make it less of just a radio station … and more of a co-op artist space," said Sear. "I want, like — let's bring weird back to radio." While the station was working to renew its license to get up and running again, it still had to broadcast something to officially stay afloat. So Sear played the Bill Withers album "Just As I Am" — the one with the song "Ain't No Sunshine" — on repeat, from his iPod, 24/7. For months. Jamie Boring, executive director of the Anchorage Downtown Partnership, said ADP has worked with the family that owns Sunshine Plaza to create "an arts organization kind of mecca" in a space that has been underutilized. Because Out North is in the building for a low rate for downtown (which ADP pays), the length of its stay there is uncertain. If an interested tenant comes along willing to pay a market-rate rent, the operation could need to quickly relocate. Out North Radio is making its comeback at a time when more low-power FM community radio stations are cropping up nationwide. The number of such stations in the U.S. and its territories nearly doubled between 2014 and 2016, according to the Pew Research Center. Such stations can only be licensed to specific entities, and "most have a broadcast reach of just a few miles and cater to intensely local and niche audiences," according to Pew. "I've seen the transition from really good community radio stations to the Clear Channel, iHeartRadio nonsense that's out now," said Sear, who has worked in radio since he was a teenager. "There's a little bit of a backlash against that now." At the moment, Sear said, the signal covers a third or maybe half of Anchorage. A big priority is getting money for a new transmitter to reach a larger audience. Arriaga said she'd like to see the station have a "completely different range" by the end of spring. KONR also wants to raise funds to get the station streaming online, "because that's the one thing everybody wants," Sear said. "It's all a bit Wild West at this point."